Mushroom & Goat Cheese Quiches Fill 1 Created with Sketch. 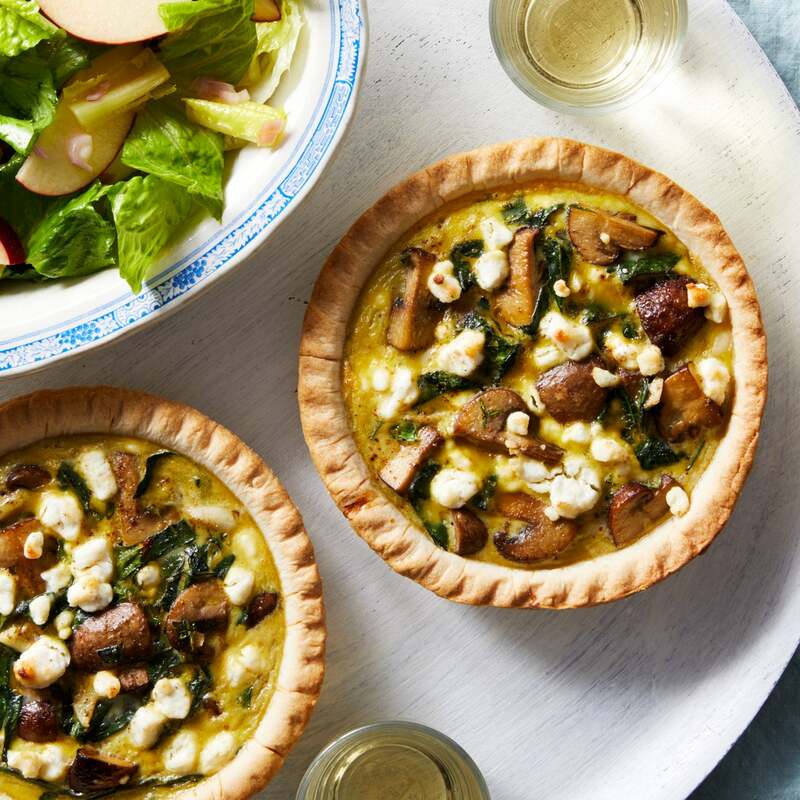 These crowd-pleasing quiches showcase a hearty duo of collard greens and cremini mushrooms. 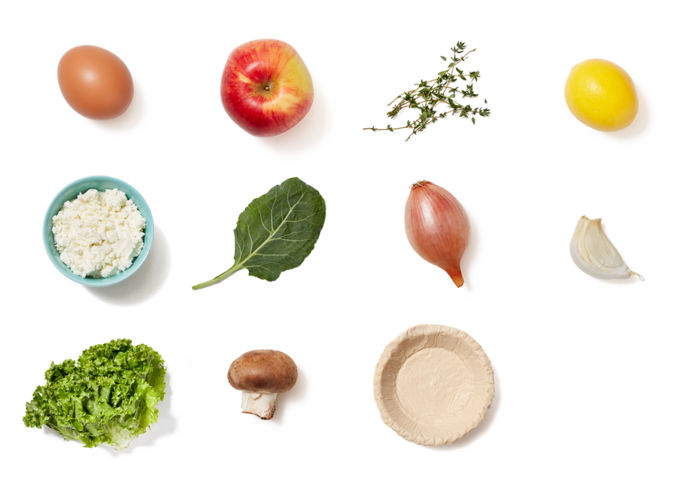 The mushrooms’ pleasantly earthy flavor is perfectly balanced by a tangy goat cheese topping and woodsy thyme. Preheat the oven to 425°F. Wash and dry the fresh produce. Quarter the mushrooms. Pick half the thyme leaves off the stems; discard the stems. Keep the remaining thyme sprigs whole. Remove and discard the stems of the collard greens; thinly slice the leaves. Peel and roughly chop the garlic. Quarter and deseed the lemon. Peel the shallot and finely chop to get 2 tablespoons (you may have extra). Place in a medium bowl and top with the juice of 3 lemon wedges. In a large pan, heat a drizzle of olive oil on medium-high until hot. 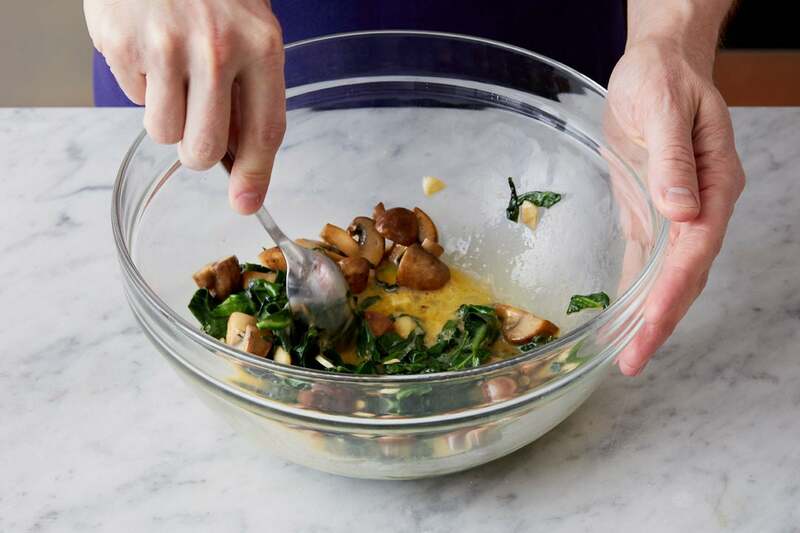 Add the quartered mushrooms in an even layer and cook, without stirring, 2 to 3 minutes, or until browned. Add the whole thyme sprigs and sliced collard greens; season with salt and pepper. Cook, stirring occasionally, 3 to 4 minutes, or until slightly wilted. 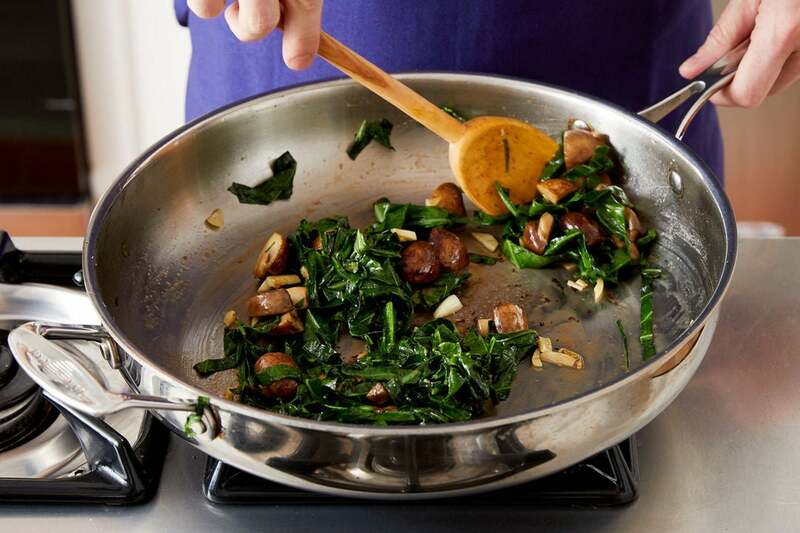 (If the pan seems dry, add a drizzle of olive oil.) Add the chopped garlic; season with salt and pepper. Cook, stirring frequently, 2 to 3 minutes, or until the collard greens are wilted. Turn off the heat; season with salt and pepper to taste. Carefully remove and discard the thyme sprigs. Crack the eggs into a large bowl; add 1/4 cup of water and beat until smooth. 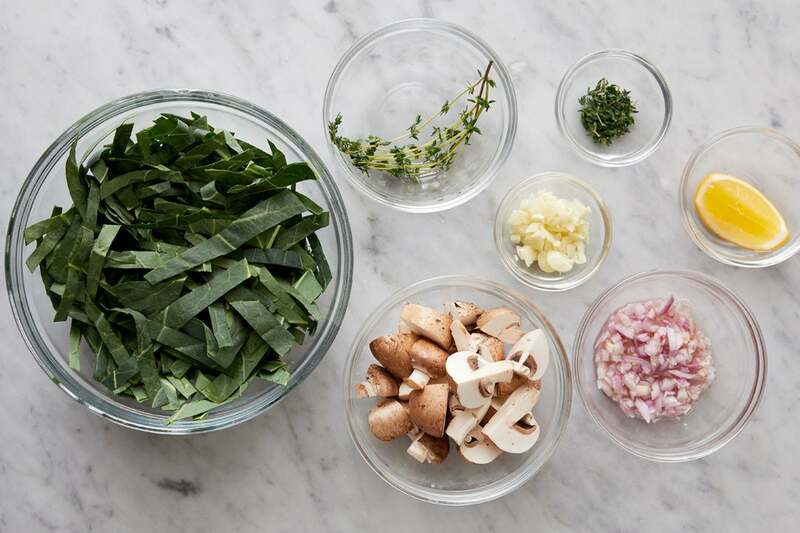 Stir in the thyme leaves and cooked vegetables; season with salt and pepper. Place the pie crusts on a sheet pan, leaving them in their tins. 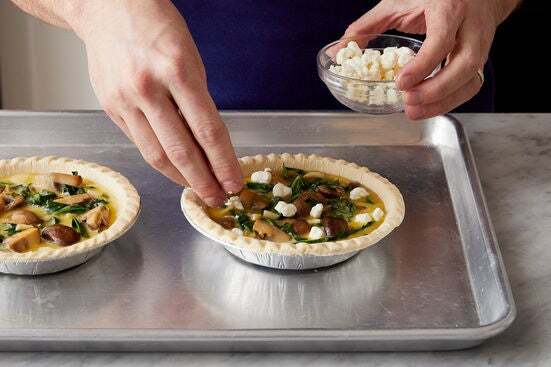 Divide the filling between the pie crusts. Evenly top with the cheese (crumbling before adding if necessary); season with salt and pepper. Bake 18 to 20 minutes, or until the crusts are browned and the filling is set and cooked through. Remove from the oven and let stand for at least 5 minutes. While the quiches bake, cut off and discard the root end of the lettuce; roughly chop the leaves. Quarter and core the apple, then thinly slice crosswise; place in a bowl and top with the juice of the remaining lemon wedge to prevent browning. To make the vinaigrette, slowly whisk 1 tablespoon of olive oil into the bowl of shallot-lemon juice mixture until well combined. Season with salt and pepper. 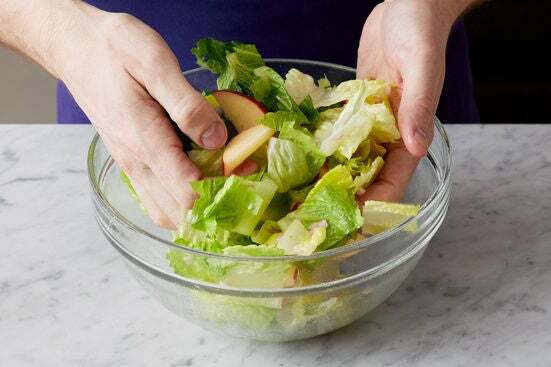 Just before serving, in a large bowl, combine the chopped lettuce and sliced apple. 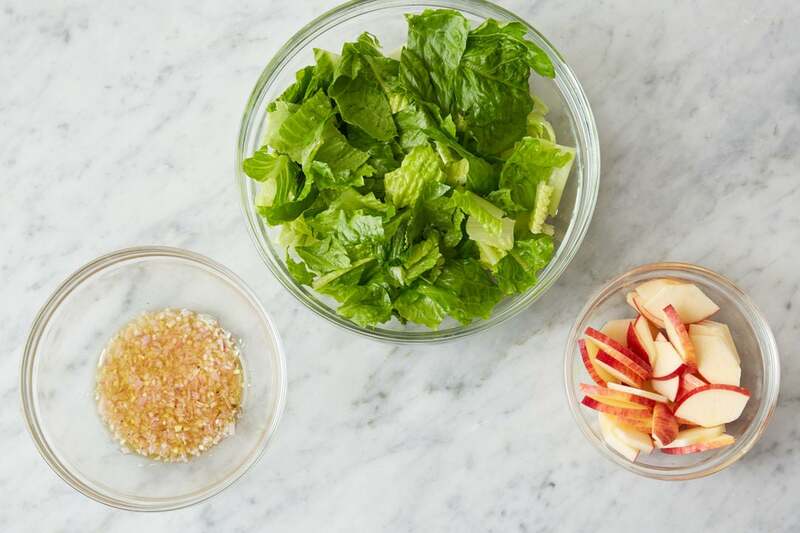 Add enough of the vinaigrette to coat the salad (you may have extra vinaigrette). Toss to combine; season with salt and pepper to taste. Serve the baked quiches with the salad on the side. Enjoy!